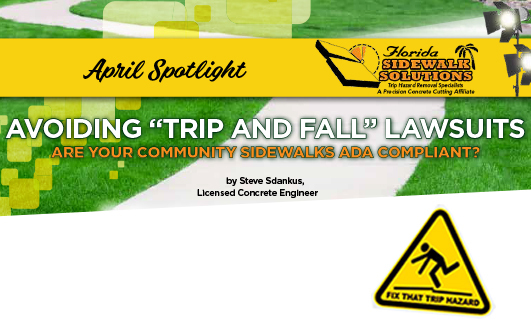 ARE YOUR COMMUNITY SIDEWALKS ADA COMPLIANT? Uneven sidewalks can be hazardous to your health. One trip and fall on an uneven sidewalk can be very costly and quite painful. A trip and fall on an uneven sidewalk law suit can wipe out all the reserves and then some, from a property managed community. It is the responsibility of the sidewalk owner to maintain it. In 1990 the Americans with Disabilities Act defined a trip hazard as any vertical change over ¼” or more at any joints or cracks. Most property owners or officials of public entities are aware of trip hazards. Some decision makers decide that they will only repair or replace hazards greater than 1” when most accidents happen on the smaller ¼” trip hazards. As a handicapped person and former athlete with two total knee replacements, many knee surgeries and back surgery as well as a son of an elderly person, I know firsthand how hard and frustrating it is to walk on an uneven sidewalk or walkway with a walker and crutches. As co-owner of Florida Sidewalk Solutions for the past 14 years, it has been mine and my wife’s mission to help make sidewalks safer and easier to walk on with disabilities. The pedestrian trips and falls causing bumps, bruises, lacerations and say a broken hip. The pedestrian or someone else calls 911, now a patient gets a ride to the emergency room in an ambulance. X-rays, MRI, bloodwork, doctor and hospital fees, specialists and most likely months of Physical Therapy. Now the attorney’s start calling asking to represent to be compensated. After many subpoenas and depositions , there are lists of people that they will try to sue. The city where the sidewalk is located, any contractor that ever worked on the sidewalks, the Property Manager, the Property Management company, the Board of Directors and then even the homeowner, where the fall took place in front of. Sidewalk maintenance and records of all replacements or repairs must be filed accurately and it will save money while defending your efforts in court. GIS mapping is now available to pin point every hazard on a Google map. This allows easy audit of sidewalks and helps maintain accurate sidewalk maintenance records. Many people are injured on uneven sidewalks each day. Some people get seriously injured and then there are people that trip and fall on purpose to make money. However, their story will come out one way or another and your insurance rates can increase, or your policy could be dropped, if there is an incident reported. With all this said, keeping your sidewalks ADA compliant and in check with federal laws can prevent unnecessary pain and suffering. Records of maintenance is usually the first item the courts will review in a sidewalk trip and fall accident case. As South Florida’s sidewalk experts, we’re here to help. 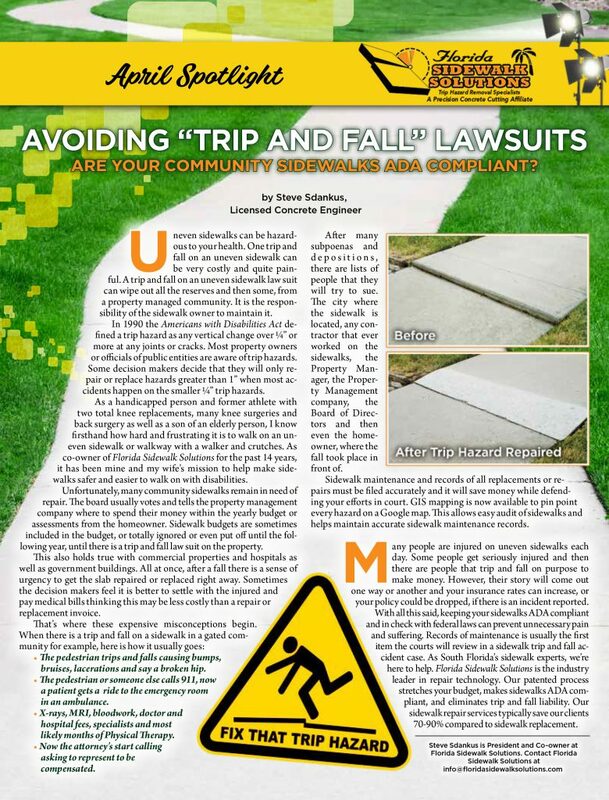 Florida Sidewalk Solutions is the industry leader in repair technology. Our patented process stretches your budget, makes sidewalks ADA compliant, and eliminates trip and fall liability. Our sidewalk repair services typically save our clients 70-90% compared to sidewalk replacement.